The alleged Asus ZenFone 6Z flagship phone that has a model number of ASUS_I01WD has been spotted on Geekbench with key specs. The ZenFone 5 series included ZenFone 5Q Lite, ZenFone 5 and ZenFone 5Z. The ZenFone 5 was a mid-range phone powered by Snapdragon 636 SoC whereas the ZenFone 5Z flagship smartphone was fueled by Snapdragon 845 mobile platform. 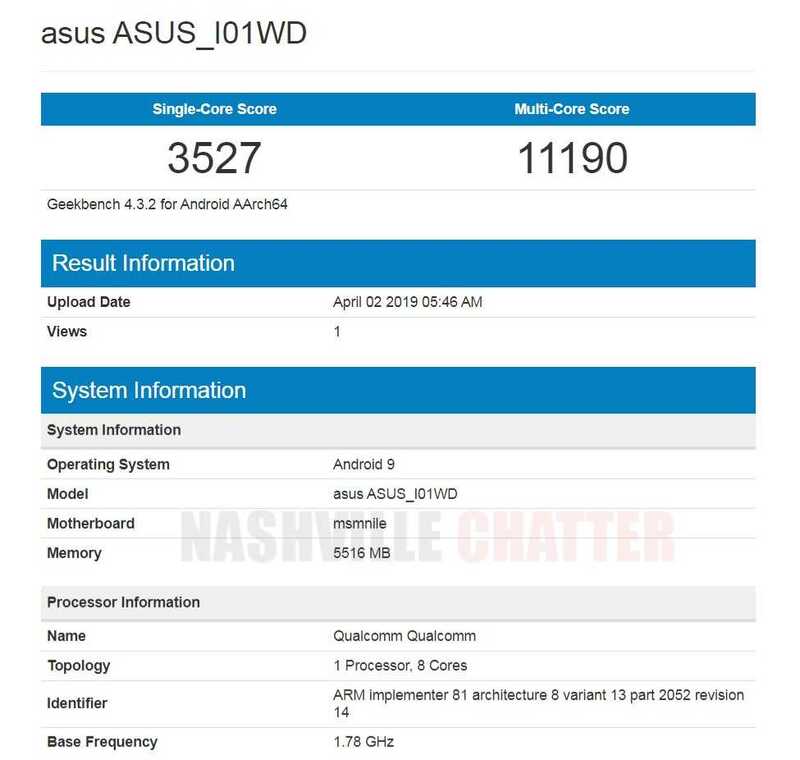 Hence, it appears that the ASUS_I01WD could be the first successor of the ZenFone 5Z. Hence, it is likely to debut in the market as Asus ZenFone 6Z. According to the Geekbench listing of ASUS_I01WD, the alleged ZenFone 6Z will be arriving with Snapdragon 855 chipset that has a codename of “msmnile”. The SoC is supported by 6 GB of RAM. The smartphone is running on Android 9 Pie OS. In the single-core and multi-core tests of Geekbench, the purported ZenFone 6Z has respectively scored 3527 and 11,190. The benchmarking scores are quite impressive and are on par with other Snapdragon 855 fueled smartphones. The ASUS_I01WD model had recently bagged from National Communication Commission (NCC) in Taiwan. Earlier in this year, the same model had bagged Wi-Fi Alliance certification. The Taiwanese manufacturer has confirmed that it will be launching the ZenFone 6 series on May 16. Probably, the ZenFone 6 lineup may include smartphones like ZenFone 6 Lite entry-level smartphone, ZenFone 6 mid-range phone and ZenFone 6Z flagship smartphone. The ZenFone 6Z smartphone will be equipped with a triple camera setup. The handset may sport a punch-hole display that could be integrated with an in-screen fingerprint reader. Some rumors have claimed that it may arrive as a slider phone. Since the launch event of the ZenFone 6 series is several weeks away, the rumor mill may reveal more information on it in the near future.